Effective immediately for remainder of season, and in addition to the existing heat policy where all games can be called off the night before. On Saturday Feb 2 (after 6pm), the 10:30am forecasted temperature at Windsor Gardens was 34 degrees. Unusually, the temperature at some grounds, at around 10-10:30, was warmer - 38 at some venues. Just as we piloted the use of the BOM App and more-appropriate, morning forecast-data last season; for the rest of this season, we will use the current temperature to assist umpires and coaches to calmly cease play. 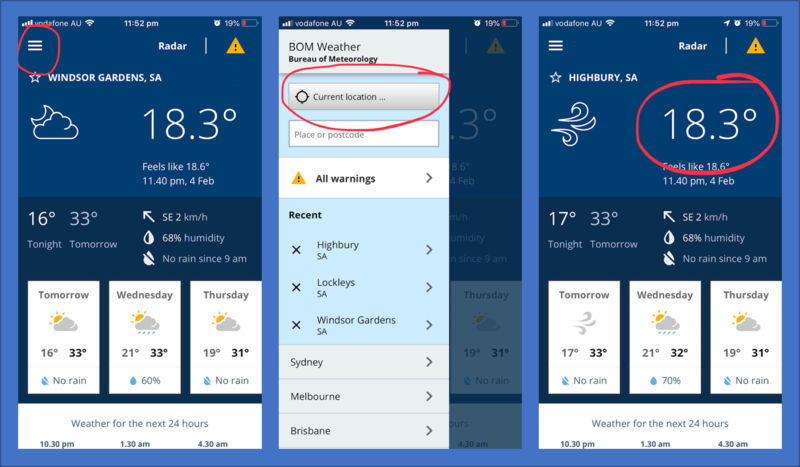 If during your morning or afternoon match, the actual temperature at your Current Location (see BOM App screenshot below) reaches 36 degrees, play must stop and the match will be deemed a draw, exactly like if you experienced lightning, or a sudden downpour. As per the Wet Weather policy, “after the scheduled completion of the round, the NEJCA Executive will review the matches played and if less than 75% of the matches were played per division (1, 2 or 3) the complete round per division will be cancelled for premiership points”. The delegates were very strong in their opinion too, that no one should be feeling so uncomfortable at a NEJCA community club cricket match, that their child's health is put ahead of premiership points. Instructions: on the morning of play, open the BOM App, click the hamburger menu (the three horizontal lines, top-left), click Current Location and observe the temperature. If that value is 36 or more, play is to cease calmly, regardless of match state. We are treating that weather condition, the same as lightning, or sudden downpour.